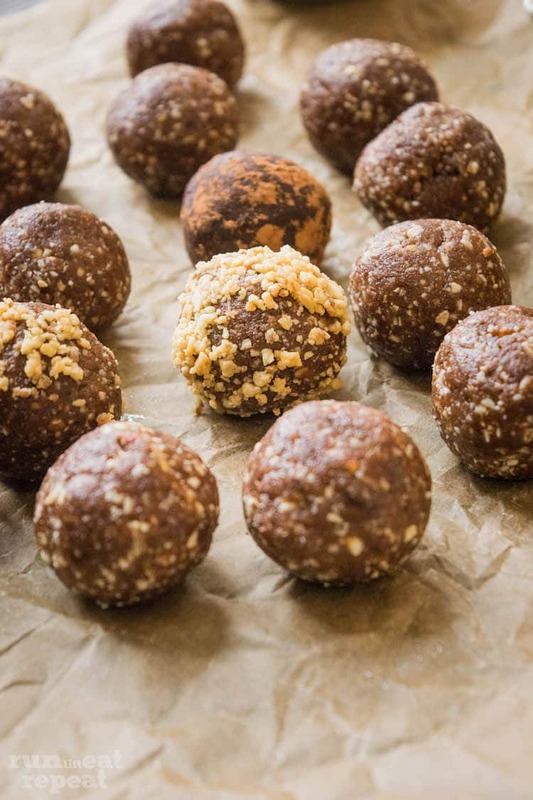 Healthy Peanut Butter Brownie Bites. 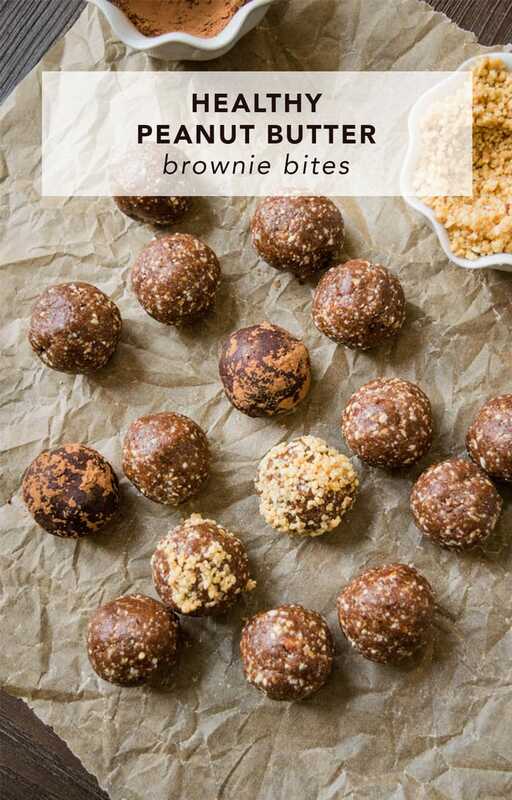 These brownie bites are made from just 5 good-for-you ingredients! Welcome to THE greatest snack. What are your goals for this year? Besides focusing on self love, two of my biggest goals include snacking smarter and achieving the body fat % I want. And it’s safe to say that I’m on the path to both— aside from one of the worst workouts that I’ve ever had. But that’s a whole other (ugly) story. I eat relatively healthy at all my meals, but there’s something about that sweet tooth that kicks in around 9pm. I typically try to keep a batch of these on hand in the refrigerator most days. But if you know me– I needed variety. To switch things up a bit, I made a batch using the beloved peanut butter♥ The best part: incredibly simple and made with wholesome, healthy ingredients. 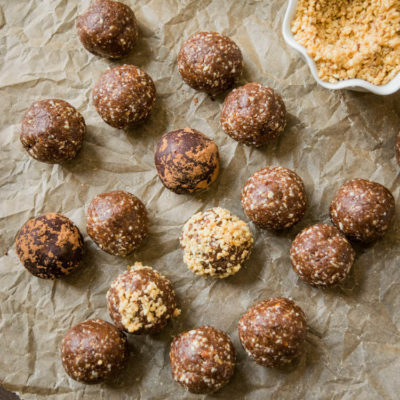 Naturally gluten free, no refined sugar, and full of chocolate flavor. And that my friends makes me really happy. Pulse it all together until the mixture starts coming together, roll them into balls, and BAM! you’ve got yourself a little treat! And there’s room for customization too! Not a fan of peanut butter? Swap it out with almond butter. Or try cashews and cashew butter! 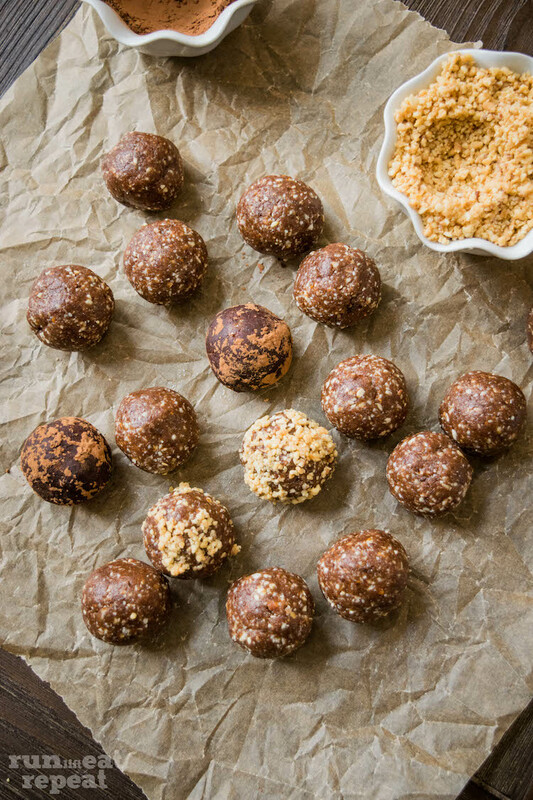 Brownie points for a healthier sweet tooth fix snack! Made from just 5 good-for-you ingredients! Soak the dates in warm water for about 10 minutes to plump up. Meanwhile, line a large baking sheet with parchment paper or a silicone baking mat (for easy clean up.) Set aside. Place the dates1, almonds2, cocoa powder, peanut butter3, honey and salt into the food processor or blender. Blend/pulse together until a moist, crumbly dough forms— it should come together with your hands. This will take a few minutes of blending/pulsing. If the dough is too dry, add in a few more dates. Once the dough is formed, scoop 1 Tablespoon of dough and roll into a smooth ball. Place onto the prepared baking sheet. Repeat with remaining dough. 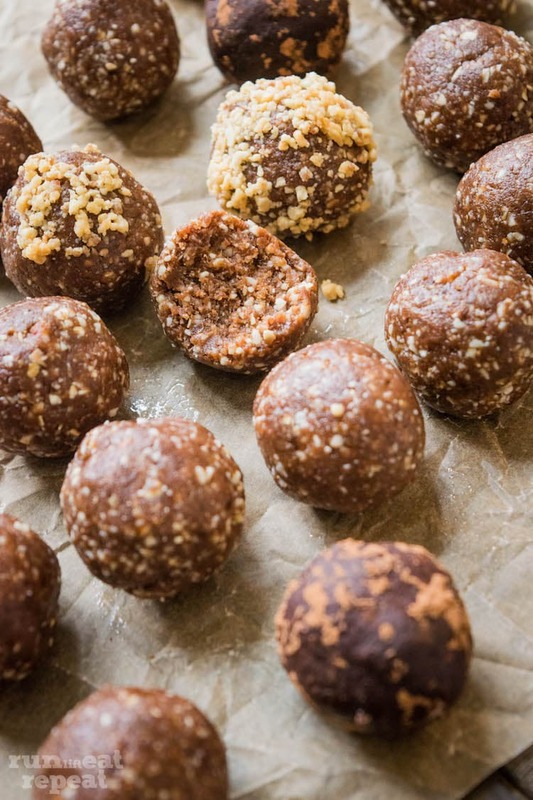 If coating: roll the balls into the crushed peanuts or cocoa powder. Place in the refrigerator for 30 minutes to allow them to set. Cover tightly and store in the refrigerator for up to 1 week. Make ahead tip: These bites can be frozen for up to 3 months until stored in an air tight bag or container. Thaw overnight in the refrigerator. 1Dates can be found in the produce section of any grocery store. Be sure to soak into warm water as it will add more moisture to these. If this step is skipped, additional nut butter will be needed. 2Peanuts don't have to be used - use your favorite! 3Not a fan of peanut butter? 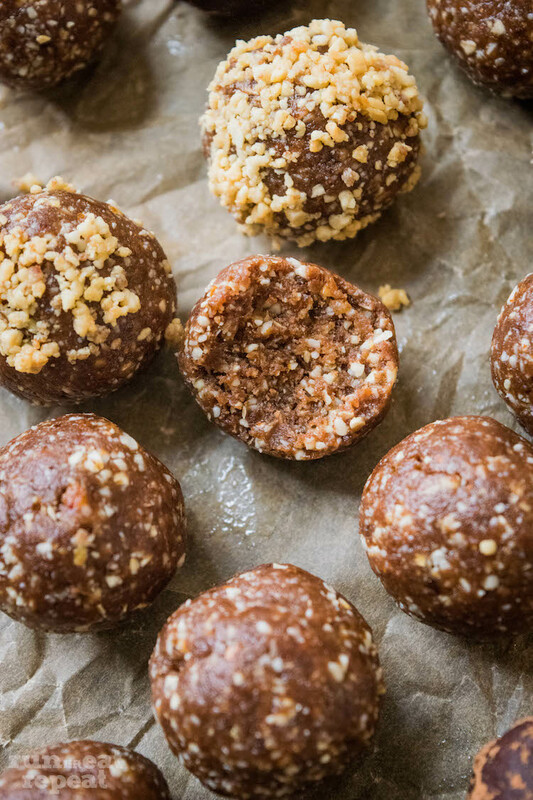 Swap it out with your favorite nut butter.